Cross a pumpkin pie with a pecan pie, and you get the best of both worlds–and it tastes as good as it looks! 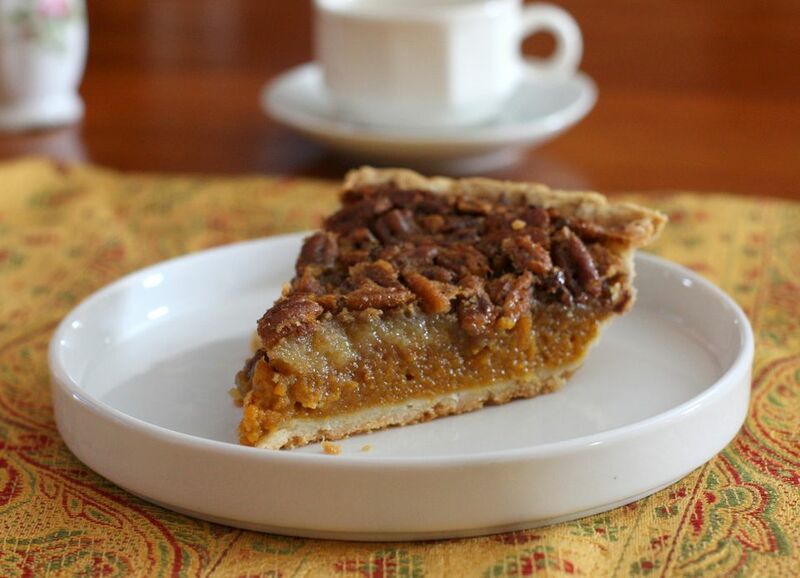 This pumpkin pecan pie will impress your friends and family, and it's the perfect pie for your Thanksgiving or Christmas dessert menu. The pumpkin layer is topped with a classic pecan pie layer and baked to perfection in a homemade or ready-made pie shell. I've included instructions for a basic food processor pie pastry as well. If using a frozen pie crust, do not thaw; preheat a baking sheet in the oven and place the pie on the cookie sheet. Or use the recipe ( instructions below) for a food processor crust. In a small bowl, combine one egg, pumpkin, 1/3 cup sugar, cinnamon, ginger, cloves, and salt. Spread in pie crust. In a medium bowl, beat remaining two eggs slightly. Stir in the corn syrup and remaining 2/3 cup sugar, the melted butter, and vanilla; stir until well blended. Stir in pecans. Carefully spoon over pumpkin mixture. Bake the pie for 50 to 60 minutes or until filling is set around edge. Cool pie completely on wire rack. In a food processor, pulse the flour with the salt and 1 or 2 tablespoons of sugar. Scatter the pieces of chilled butter over the flour mixture and then pulse 5 or 6 times, or until it resembles coarse crumbs. There should be some pea-size pieces of butter still visible. Add 3 to 5 tablespoons of ice water in a stream while the machine is running, just until the dough begins to form clumps. Turn it out onto a floured surface and squeeze it until it holds together. Moisten your hands if necessary, but don't knead the dough or overwork it. Shape the dough into a flattened disk and wrap in plastic wrap. Roll the chilled dough out on a floured surface to an 11- or 12-inch circle and line the pie plate. Flute the edge as desired.